A picture taken in a abandoned village near the southern Iranian city of Sirjan shows dead pistachio trees in a field that farmers left behind because of the lack of water, Aug. 14, 2016. Iran's central province of Isfahan has seen a second consecutive day of street protests against water shortages, as lawmakers warned that millions of residents will have no tap water as soon as next month. A social media video monitored by RFE/RL's Radio Farda, a sister network of VOA, and identified as being shot in the city of Isfahan on Wednesday, showed riot police confronting a crowd of protesters on a street. Radio Farda said the police warned the protesters that they could be arrested for chanting antigovernment slogans, but no detentions were reported. An earlier social media video monitored by RFE/RL and posted Tuesday showed protesters marching peacefully in the same city and denouncing the government for the lack of water. Iranian state news agency ISNA quoted lawmaker Hasan Kamran telling parliament Tuesday that 5 million people in Isfahan province will not have tap water by late May. ISNA said another lawmaker, Hosein Ali Haji-Deligani, predicted that provincial residents will run out of tap water later, in July. Iranian state TV said parliament held a closed-door session Wednesday to discuss the nation's water crisis, with the ministers of energy and agriculture in attendance. There was no immediate word on the outcome of the session. Iranian farmers in Isfahan's rural town of Varzaneh began protesting water shortages in February, angered by authorities diverting local river water to the neighboring province of Yazd for industrial use. Those protests escalated into violent confrontations with security forces last month. 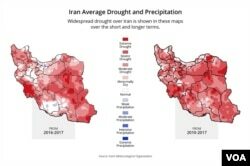 Iranian officials have acknowledged that outdated agricultural and irrigation systems and poor water management policies in the past three decades have contributed to national water shortages. Below-average levels of precipitation in recent months have exacerbated the situation. Shahram Bahraminejad of VOA's Persian Service contributed to this report.